A colonial protest against the Stamp Act of 1765. In the wake of Britain victory in the Seven Years'/French & Indian War, the nation found itself with a burgeoning national debt that had reached £130,000,000 by 1764. In addition, the government of the Earl of Bute made the decision to retain a standing army of 10,000 men in North America for colonial defense as well as to provide employment for politically connected officers. While Bute had made this decision, his successor, George Grenville, was left with finding a way to service the debt and pay for the army. Taking office in April 1763, Grenville began examining taxation options for raising the necessary funds. Blocked by the politic climate from increasing taxes in Britain, he sought to find ways to produce the needed income by taxing the colonies. His first action was the introduction of the Sugar Act in April 1764. Essentially a revision of the earlier Molasses Act, the new legislation actually reduced the levy with the goal of increasing compliance. In the colonies, the tax was opposed due to its negative economic effects and increased enforcement which hurt smuggling activities. In passing the Sugar Act, Parliament indicated that a stamp tax could be forthcoming. Commonly used in Britain with great success, stamp taxes were levied on documents, paper goods, and similar items. The tax was collected at purchase and a tax stamp affixed to the item showing that it had been paid. Stamp taxes had been previously proposed for the colonies and Grenville had examined draft stamp acts on two occasions in late 1763. Towards the end of 1764, petitions and news of colonial protests regarding the Sugar Act reached Britain. Though asserting Parliament's right to tax the colonies, Grenville met with colonial agents in London, including Benjamin Franklin, in February 1765. In the meetings, Grenville informed the agents that he was not opposed to the colonies suggesting another approach to raising the funds. While none of the agents offered a viable alternative, they were adamant that the decision should be left to the colonial governments. Needing to find the funds, Grenville pushed the debate into Parliament. After a lengthy discussion, the Stamp Act of 1765 was passed on March 22 with an effective date of November 1. As Grenville began to appoint stamp agents for the colonies, opposition to the act began to take form across the Atlantic. Discussion of the stamp tax had begun the previous year following its mention as part of the passage of the Sugar Act. Colonial leaders were particularly concerned as the stamp tax was the first internal tax to be levied on the colonies. Also, the act stated that admiralty courts would have jurisdiction over offenders. This was viewed as an attempt by Parliament to lessen the power of the colonial courts. The key issue that quickly emerged as the centerpiece of colonial complaints against the Stamp Act was that of taxation without representation. This derived from the 1689 English Bill of Rights which forbade the imposition of taxes without the consent of Parliament. As the colonists lacked representation in Parliament, taxes imposed upon them were deemed to be a violation of their rights as Englishmen. While some in Britain stated that the colonists received virtual representation as members of Parliament theoretically represented the interests of all British subjects, this argument was largely rejected. The issue was further complicated by the fact that the colonists elected their own legislatures. As a result, it was the colonists' belief that their consent to taxation rested with them rather than Parliament. In 1764, several colonies created Committees of Correspondence to discuss the repercussions of the Sugar Act and to coordinate action against it. These committees remained in place and were used to plan colonial responses to the Stamp Act. By the end of 1765, all but two the colonies had sent formal protests to Parliament. In addition, many merchants began boycotting British goods. While colonial leaders were pressuring Parliament through official channels, violent protests erupted throughout the colonies. In several cities, mobs attacked stamp distributors' houses and businesses as well as those of government officials. These actions were partially coordinated by a growing network of groups known as the "Sons of Liberty." Forming locally, these groups were soon communicating and a loose network was in place by the end of 1765. Usually led by members of the upper- and middle-class, the Sons of Liberty worked to harness and direct the rage of the working classes. In June 1765, the Massachusetts Assembly issued a circular letter to the other colonial legislatures suggesting that members meet to "consult together on the present circumstances of the colonies." Convening on October 19, the Stamp Act Congress met in New York and was attended by nine colonies (the rest later endorsed its actions). Meeting behind closed doors, they produced the "Declaration of Rights and Grievances" which stated that only colonial assemblies had the right to tax, the use of admiralty courts was abusive, colonists possessed the Rights of Englishman, and Parliament did not represent them. In October 1765, Lord Rockingham, who had replaced Grenville, learned of the mob violence that was sweeping across the colonies. As a result, he soon came under pressure from those who did not wish Parliament to back down and those whose business enterprises were suffering due to the colonial protests. With business hurting, London merchants, under the guidance of Rockingham and Edmund Burke, began their own committees of correspondence to bring pressure on Parliament to repeal the act. Disliking Grenville and his policies, Rockingham was more predisposed to the colonial point of view. During the repeal debate, he invited Franklin to speak before Parliament. In his remarks, Franklin stated that the colonies were largely opposed to internal taxes, but willing to accept external taxes. After much debate, Parliament agreed to repeal the Stamp Act with the condition that the Declaratory Act be passed. This act stated that Parliament had the right to make laws for the colonies in all matters. The Stamp Act was officially repealed on March 18, 1766, and the Declaratory Act passed the same day. While unrest in the colonies subsided after the Stamp Act was repealed, the infrastructure that it created remained in place. The Committees of Correspondence, Sons of Liberty, and system of boycotts were to be refined and used later in protests against future British taxes. The larger constitutional issue of taxation without representation remained unresolved and continued to be a key part of colonial protests. 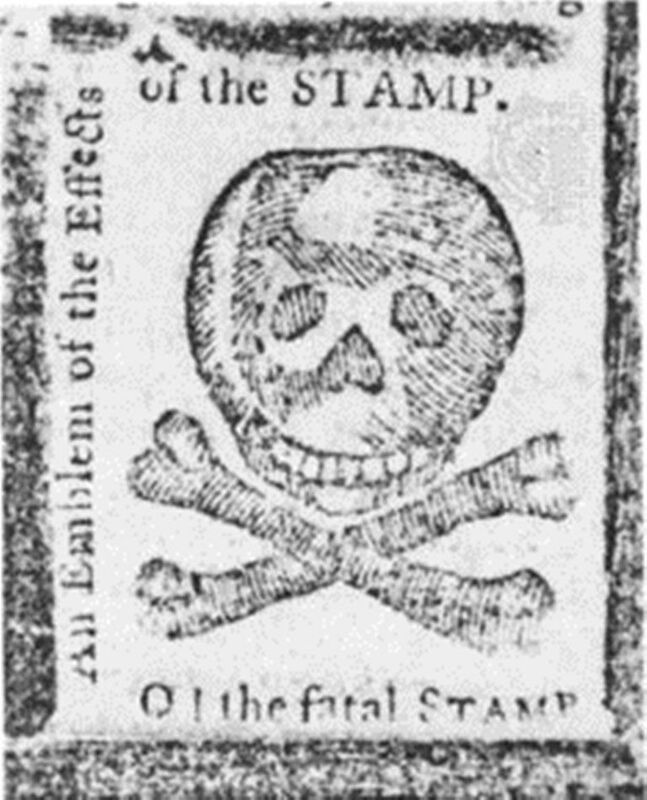 The Stamp Act, along with future taxes such as the Townshend Acts, helped push the colonies along the path towards the American Revolution.